I love living in Portland, Oregon. 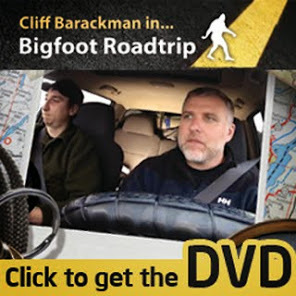 I am held spellbound by the terrain, people, weather, beer, and the access to squatchy wilderness. Art abounds in town, and where one finds art, the 'squatch is usually not far away. Santiago Uceda is a Peruvian born artist now residing in Corvallis, Oregon. 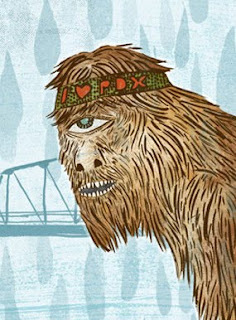 he created a tribute to both the 'squatch and Portland in his piece entitled, "Portland Hipster Bigfoot." "I created this illustration for the Society6 Portland poster series, the challenge was to create something based on Portland fun facts. The poster series which is curated byMark Searcy will be for sale on Society6 as open-edition, giclee prints – and possibly a future group show in Portland. 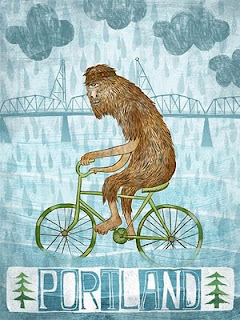 Bigfoot isn’t necessarily a Portland fun fact, but he would probably fit right in and wouldn’t be harassed by the locals, nobody would question why there’s a smelly bigfoot cyclops hipster riding his bicycle in the Willamette river in search of salmon."